Deshaun Watson is a dynamic quarterback, but he also takes a ton of sacks. It's another week, and another must win game for the Philadelphia Eagles, as they'll take on something of an unfamiliar foe in the 10-4 Houston Texans. Here are five matchups to watch. The Eagles' biggest and most consistent strength this season has been their pass rush. The biggest weakness on the Texans' roster is their offensive line. Deshaun Watson holds onto the ball for an eternity. On the season, on average, Watson takes 3.03 seconds from snap to throw. Only Josh Allen and Lamar Jackson take longer to throw. The Texans have allowed 52 sacks and 107 hits on the quarterback this season, both of which lead the NFL. They've also allowed at least 3 sacks in each of their last 6 games, and 26 sacks overall during that span. It is imperative that the Eagles' pass rush does not allow Watson to extend plays with his feet and make big plays down the field. They must get after Watson, and get him on the ground. All season long, the Eagles have faced prolific rushing offenses. In fact, five of their opponents so far this season are in the top eight in the NFL in rushing yards per game. They would be the Panthers (3), Cowboys (4), Titans (5), Rams (7), and Saints (8). The Texans check in at No. 6. Houston's rushing offense is more like the Panthers, Cowboys, and Titans (teams that get a boost in numbers from mobile quarterbacks) than they are the Rams and Saints (teams with star running backs that also often have big leads). The Texans' leading rusher so far this season is Lamar Miller, who has rushed 193 times for 917 (4.8 YPC) and 6 TDs. Miller's availability on Sunday is in question after he injured an ankle Week 15 against the Jets. There's a possibility that D'Onta Foreman could make a return to the lineup for the first time since he ruptured his Achilles in November last season. Whether it's a hobbled Miller, a rusty Foreman, or an ineffective Alfred Blue, the Texans' run game is likely going to be hampered to some degree. This feels like a classic 2017 Jim Schwartz game, where he'll want to (a) shut down the run, (b) make the opposing offense one-dimensional, and finally (c) release the hounds on the quarterback. There's an argument to be made that DeAndre Hopkins is the best wide receiver in the NFL. Since he entered the league in 2013, he has 507 receptions for 7,186 yards and 47 TDs. Only Antonio Brown and Julio Jones have more receiving yards, and only Brown has more receiving TDs. Brown and Jones had good quarterbacks. 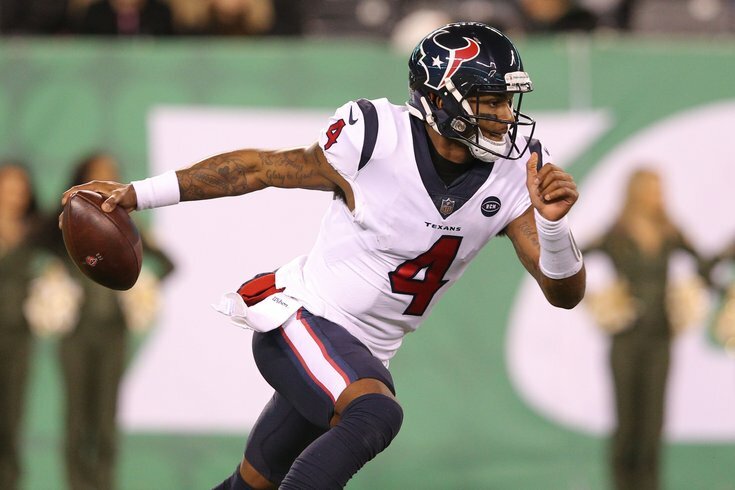 Before Watson came along, Hopkins had guys like Brian Hoyer, Brock Osweiler, Case Keenum, Matt Schaub, Ryan Fitzpatrick, T.J. Yates, Ryan Mallett, and Tom Savage throwing him the ball. "I think probably the biggest thing that stands out for me is he's so strong with contested catches," Schwartz said of Hopkins. "He must have incredibly strong hands and he has a knack for getting the ball. He has some rebounder-type skills in him. "That play he made to win the game or to give them the lead -- not to win the game but to give them the lead, I mean, you can't cover a guy much better than that. And not only does he high point the ball and he's strong enough to squeeze it, he's also strong enough to come down with that ball in his hand. He's a threat to run after the catch. He's one of the best receivers in the NFL." Just as mobile quarterbacks are nothing new to the Eagles, neither are great receivers. In 2018 alone, the Eagles' secondary has had to face Julio Jones, Mike Evans, DeSean Jackson, T.Y. Hilton, Adam Thielen, Stefon Diggs, Odell Beckham Jr. twice, Amari Cooper twice, Michael Thomas, and Brandin Cooks, with mixed results. The Eagles will obviously have to have a plan for Hopkins. Lane Johnson is likely to see a lot of J.J. Watt and Whitney Mercilus, while Jason Peters is likely to see a lot Jadeveon Clowney. "Obviously two of the best edge rushers in the game but not only that, they are complete players," Mike Groh said. "You have to account for them all the time and know where they are and have a really good plan at pass protection like I know we will. I know our guys will be up for the challenge." Watt, as usual, is having an All-Pro season, as he has 14.5 sacks and 6 forced fumbles. Clowney has 8 sacks of his own. Against the Rams, the Eagles' offensive line gave Nick Foles plenty of time to throw, and the Eagles held the Rams to zero sacks. They'll need to keep Watt and Clowney from wrecking the game. Jeffery had a breakout game last Sunday in L.A., catching eight passes for 160 yards. Foles seemed willing to chuck it up to Jeffery, allowing him to try to win contested catches, and Jeffery rewarded him by snagging all eight of his targets. This might be another matchup where it makes sense to let Jeffery go up and get it.